Emergency crews are responding to a four-car accident at U.S. Highway 177 and County Line Road south of Ponca City at this hour. 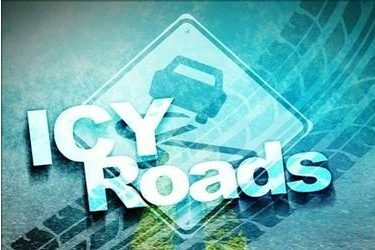 Deputies from the Kay County Sheriff’s Office are advising of extremely dangerous icing conditions on a bridge at the location and have requested the Department of Transportation to respond to emergency conditions. Ponca City EMS ambulance has responded along with the Kay County Sheriff’s Office and the Oklahoma Highway Patrol. Deputies expect the scene to be closed for most of the day. No information is available on the vehicles involved in the accident or the condition of those in the vehicles. Drivers are advised to avoid the area because traffic is backed up and visibility is extremely poor. The Department of Transportation has arrived to sand the bridge as of 8:40 a.m. Thursday, which deputies expect to make it possible for backed-up drivers to cross the bridge. U.S. 60 across the New River Bridge between Ponca City and Osage County also is extremely icy with accidents reported. Drivers are advised to avoid traveling east from Ponca City until the bridge can be iced or until weather conditions allow for melting of the ice. At least one passenger has been transported by ambulance from an acciddent on the bridge. Hubbard Road north of Ponca City also is extremely icy and hazardous for drivers. A one-car accident has been reported at Hubbard Road and Waverly Avenue. Please avoid this area as well. A second accident was reported in the same area after a car reportedly hit a bridge. A rollover accident has been reported on U.S. 60 west of Ponca City where North Avenue splits off from the highway. No additional information is available at this time. 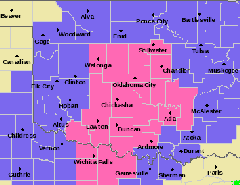 The National Weather Service in Norman has issued an urgent winter weather message warning of the winter storm’s impact to the area. Mixed precipitation, with a combination of snow and sleet, can accumulate with amounts up to 4 inches, the report says. Ice accumulations of around two-tenths of an inch is possible from freezing rain. This forecast covers portions of central, southern, southwest and western Oklahoma and northern Texas. Freezing rain will transition to sleet and snow Thursday morning and will continue until late Thursday night.